A gunman opened fire on Republican members of Congress during a baseball practice near Washington early on Wednesday, wounding several people including House of Representatives Majority Whip Steve Scalise before being taken into custody, police and witnesses said. Five people were transported medically from the scene in Alexandria, the city's police chief, Michael Brown told reporters. 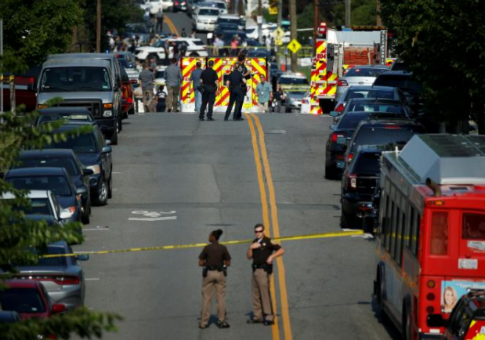 Two of the wounded were Capitol Hill police who were at the scene, witnesses said. In a dramatic blow-by-blow account, Representative Mo Brooks of Alabama told CNN the gunman was armed with a rifle and appeared to be a white male. Brooks said he saw the man only for a second, and that he was shooting from a chain link fence behind the third base position on the field where the congressional group was holding an early morning morning practice ahead of a game against Democrats this week. "There must have been 50 to 100 shots fired," he told CNN. "I hear Steve Scalise over near second base scream. He was shot," said Brooks, adding he helped apply a tourniquet with his belt to a congressional staffer who was shot in the leg. "One of our security detail was shooting back, but it was our pistol versus the shooter's rifle," Brooks said. "The only weapon I had was a baseball bat." Republican Senator Jeff Flake told local ABC-TV Scalise was shot in the left hip. Flake said the gunman was shot. U.S. President Donald Trump said in a Twitter message that Scalise, "a true friend and patriot, was badly injured but will fully recover. Our thoughts and prayers are with him." Scalise's position as whip in the Republican-controlled House makes him one of the most senior figures in Congress. He is a representative from Louisiana. The group were practicing for the annual Democrats versus Republicans congressional baseball game that was scheduled to be played on Thursday. "It's pretty well known in the neighborhood who those folks are on the baseball field," Brooks said. "It's not a secret we are practicing … He was going after elected officials." Democrats were also practicing at another field at a different location, CNN reported. Reba Winstead lives across the street from the parking lot of the park where the shooting occurred. "I was on my front porch and that is when I heard the first round of shots. There was about a dozen shots. There was a pause. Then there was more shooting. I called 911." Trump, a Republican, said in a statement that he and Vice President Mike Pence were monitoring developments closely. "We are deeply saddened by this tragedy. Our thoughts and prayers are with the members of Congress, their staffs, Capitol Police, first responders, and all others affected," he said. Steve Scalise is the third-highest ranked member of the Republican leadership in the House, and has the difficult job of trying to keep order in the fractious party ranks and rounding up votes for bills. This entry was posted in Politics and tagged Congress, Virginia. Bookmark the permalink.